The fullback hasn’t played since November. Halfpenny has been sidelined since November. 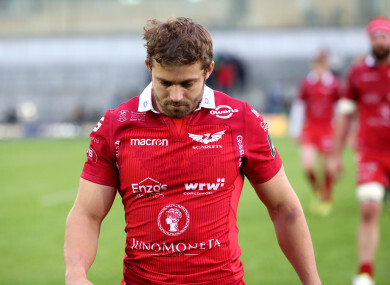 WALES FULLBACK LEIGH Halfpenny is set to miss the beginning of the Six Nations campaign due to an ongoing battle with concussion, his Scarlets head coach Wayne Pivac confirmed today. The 30-year-old has been out of action since the Test with Australia on 10 November and Pivac said the latest prognosis had been made following a visit by the 80-times capped star to a specialist. Prior to this Halfpenny had been on the brink of a comeback for Scarlets against Cardiff but pulled out because he was plagued by headaches. Wales’ opening Six Nations game is against France in Paris on 1 February, followed by a clash with Italy in Rome eight days later. “Leigh has seen the specialist and won’t be used for the next three to five weeks,” said Pivac. “He will continue training and doing what he’s been doing, and then he will be reassessed. “It will be somewhere between three to five weeks, but these things take time. That’s the time-frame we’re looking at. Leigh won’t play before that time, that will be the earliest. We will pass on the medical information to the Welsh Rugby Union. Pivac, who will become the national coach after this year’s World Cup, said it would be down to Warren Gatland if he plays him at all. “That will then be (Wales head coach) Warren’s (Gatland) call as to what he does, because the tournament runs for longer than that,” said Pivac. “He’s running, he’s training, and from time to time I think he’s been having bouts of (headaches). Pivac, a former head coach of Fiji, said Halfpenny’s career was far from over as plenty of players had returned to the fray after concussion issues. “Lots of players have come back from it (concussion) before,” said the 57-year-old New Zealander. “Justin Tipuric and Aaron Shingler have had spells out, and both those players have returned to the top of their game at some point. Email “Worrying news as Halfpenny set to miss start of Six Nations with concussion ”. Feedback on “Worrying news as Halfpenny set to miss start of Six Nations with concussion ”.